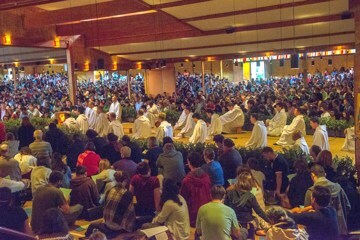 During the Gathering for a New Solidarity, every morning a brother gave a short bible meditation at the end of the prayer to introduce the theme of the day. These meditations are published here and will be used in the coming months on the "Commented Bible Passages". Thursday evening, Brother Alois also gave a meditation. We have just been singing and praying together our morning praise. In the Gospel, we heard two parables about the Kingdom of Heaven. Jesus does not speak about a far-off place or time, but tells of God who comes now and of God’s presence among us today. “You are Holy, God, enthroned on praises” (Ps 22.4). God reigns in heaven, but he sets his throne and reign also in the midst of his people who sing. “The kingdom of heaven is like treasure hidden in a field”, “like a merchant in search of fine pearls”. Jesus compares God’s coming into our life and world with the happiness of a discovery and the joy which is brought about by what is precious beyond comparison and infinitely beautiful. A man is ploughing his field. His plough hits an obstacle, but it is neither a large rock nor a stump. Obliged to interrupt his work, he looks closer and understands that he has stumbled upon treasure. This farmworker has made the find of his life! Treasure of inestimable value was slumbering in the field he was ploughing and no-one knew. The hero in the second parable is a merchant. His job was to seek out fine pearls and sell them on. But like the farmworker, one day he experiences an inexpressible joy. He finds something far better than what he was looking for: a precious pearl such as he had never seen before and which will totally change his life. The farmworker’s heart surely started to beat hard when he found the treasure. From now on, his life is secure and he will have no more worries. Happiness takes hold of him, but he remains level-headed. He hides his treasure once again. No-one at all should even know of its existence. He wants to be sure of having it for himself. To have enough money to purchase the field where it is hidden, he sells everything he has. He buys the field and the treasure is his. The merchant of pearls is equally happy when he finds the pearl of his life, more beautiful than anything seen before. He as well sells all he has to obtain his eye’s delight and heart’s joy. How should we welcome God’s kingdom? How should we welcome God who comes to reign amongst us, entering into our life and world? God’s coming places us before a rather special choice. It is not a question of choosing between good and bad. What the farmworker and the merchant renounce is not something bad. On the contrary, they renounce their goods. They renounce joyfully what is good for something that is infinitely beautiful and precious beyond compare. When God comes and enters into our lives, we have to choose. Jesus invites us to opt for joy, for treasure, for precious pearls. Joy goes hand in hand with renunciation – this is what the words of Jesus highlight. Joy has stripped the heroes of the two parables of all their goods. They dared to rejoice and their joy made them sell all they had. Christ invites us to prefer the God’s joy to our goods, our gains and our plans. It may even happen that we have to prefer joy to ourselves. Joy goes together with self-forgetting. The stories of the farmworker and merchant, who joyfully renounce their goods, teach us to which point joy is liberating. 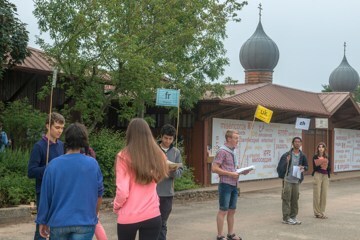 Since arriving in Taizé, which treasure or pearl have I found? What has surprised me? What has delighted me? When did renouncing something made me more happy? When has joy made me more free? Jesus knew that they wanted to ask him, so he said to them, "Are you discussing among yourselves what I meant when I said, ’A little while, and you will no longer see me, and again a little while, and you will see me’? Very truly, I tell you, you will weep and mourn, but the world will rejoice; you will have pain, but your pain will turn into joy. When a woman is in labour, she has pain, because her hour has come. But when her child is born, she no longer remembers the anguish because of the joy of having brought a human being into the world. So you have pain now; but I will see you again, and your hearts will rejoice, and no-one will take your joy from you. The time spent with Jesus was festive in nature for his friends. Jesus wanted it to be like that. Right at the beginning he had said to them “The wedding guests cannot mourn as long as the bridegroom is with them, can they?” (Mt 9:15) In the towns and villages of Galilee, festivity passed from place to place with Jesus. From the start too, Jesus had spoken enigmatic words that no-one could yet understand. “The time will come when the bridegroom is taken away.” The festive time will end. On the eve of his death, Jesus said openly, “A little while, and you will no longer see me.” We read this passage from the Gospel during prayer. Jesus knows that he is going to die. He also knows how hard this will be for his friends. “Very truly, I tell you,” says Jesus, “you will weep and mourn”. But there is something beyond this sorrow. “A little while, and you will no longer see me, and again a little while, and you will see me.” Through his death, Jesus has left, but he came back from death and his friends saw him – Mary of Magdala first of all, then Peter and John and many others. Christian joy is an Easter joy. It is not contrary to sorrow. Easter joy inhabits our pain and sorrow. It transforms them from within. “Your pain will turn into joy.” Pain and sorrow do not give way to joy, but they are turned into joy. Although they are not always turned into joy, but visited and lit up by a joy. Sorrow and joy can be present at the same time, like on autumn mornings mist and light mingle on the hill at Taizé. The Apostle Paul tells us, “Rejoice with those who rejoice, weep with those who weep,” (Rm 12:15). What should we do when at the same time we are with people experiencing joy and others who weep? We cannot put this word into practice by singing and weeping at the same time. What we could call a joyful sorrow is something that exists. There is a triumphant way of rejoicing which only makes those who are weeping more sorrowful. Easter joy is broad enough to envelope both sorrow and pain. It weeps and rejoices at the same time, bringing back a smile to disconsolate faces. In which way can joy contribute to a new solidarity? How can we rejoice with those who rejoice and weep with those who weep? How can we help each other let joy be born ever anew, even in the heart of our sorrows? Joy, simplicity and mercy are words, realities as Brother Roger liked to call them, to which he returned again and again throughout his life. He felt that they helped bring us to the very heart of what the Gospel was about and who God is. After reflecting these last two days on joy, we turn today to simplicity. How can simplicity help bring us to the very heart of things? Let’s start by looking more closely at this morning’s Gospel reading. The story begins by telling us in a straightforward matter-of-fact sort of way that Jesus was passing through Jericho and that there was this man Zacchaeus who was a chief tax collector and who was rich. A chief tax collector was someone who worked for the Roman occupiers, and who would have been considered by local people as a collaborator. And if he was rich, he was no doubt corrupt. But the story doesn’t go into that. Without further ado it goes on to tell what happens. And what follows is told not in the matter-of-fact way of that first line but is told in a more human, even touching manner. We are being invited to look beyond appearances, beyond first impressions. Now Zacchaeus is eager to see Jesus but is unable to do so because of the crowd, so he runs ahead of everyone and climbs a tree, like a child, to watch him pass by. When Jesus reaches the place, he stops suddenly and, looking up at Zacchaeus, calls him by name: “Zacchaeus, hurry and come down; for I must stay at your house today.” Perhaps Jesus, as he approached, had asked people in the crowd just who this man in the tree was. It is beautiful in any case to imagine Zacchaeus sitting there on the branch as the joy erupts on his face and he hurries down to receive Jesus. Little by little, a person emerges before us. The portrait is a poignant one. Clearly Zacchaeus is looking for something more than just a glimpse of Jesus. So let’s not think that Jesus is pretending when he says he wants to stay with Zacchaeus! Jesus must have been intrigued and really wanted to visit him. Right away the people start grumbling: “He has gone to be the guest of one who is a sinner.” As a rich chief tax collector, Zacchaeus was a pariah. Wedged as he was between an imperial regime and an unhappy populace, and living dishonestly, his situation was probably nothing short of inextricable. Amazingly, with the simplest of words and the simplest of gestures, Jesus places himself right alongside him! The people are grumbling in fact about Jesus because he is doing what no one else would ever do. Does the change happen now while the crowd grumbles or did it happen before, when Jesus first called him? Zacchaeus has changed. Just as Jesus did, now he finds the words and gestures to engage with others, to extend his hand to them. He says: “Look, half of my possessions, Lord, I will give to the poor; and if I have defrauded anyone of anything, I will pay back four times as much.” Zacchaeus will soon be welcoming not only Jesus but many others in his house. Jesus has opened the door of Zacchaeus’ heart and house, and has paved a large road leading there. “Today salvation has come to this house,” Jesus says, “because he too is a son of Abraham.” Can the people in the crowd understand, can we understand? Zacchaeus is in fact our brother. What helps us to look beyond appearances and first impressions, and to engage with people different from ourselves? Does the example of Jesus’ simplicity help me? What moves me to share what I have with others? What difference does it make to recognize others as our “brothers” and “sisters”? Our theme once again this morning is simplicity. Let us see if the Gospel passage we heard just earlier can help take our reflections another step further. It tells us about a moment in Jesus’ life when an argument broke out among his disciples. What a relief, we may be thinking: they were normal human beings after all! According to Saint Luke, it comes at one of the most important junctures of Jesus’ life, during a final meal with his disciples, not long before he will be taken away by the authorities and crucified. They were arguing, it says, about which one of them would be regarded as the greatest. It is a trying moment for the disciples. Their fears about what will happen, the uncertainty over Jesus’ and their own fate must have been intense, at the limit of what they could bear. How will their group continue if Jesus is taken away from them? Who will be their new leader? We can understand how they get to the point of arguing about who among them is the greatest. Instead of reprimanding them, Jesus intervenes by offering an image. “The kings of the Gentiles lord it over them; and those in authority over them are called benefactors.” The oppressive ways of the powerful and the ritualized praise they demanded from their subjects was a painful reality of life in the Roman empire. That at this moment Jesus should present such an image to the disciples may at first astonish us but it was no doubt salutary. It is as if Jesus were holding up a mirror to the disciples, to show them that their fears and insecurities were leading them in the wrong direction. In Jesus’ time, it was the youngest or else servants who attended most closely to the lives and needs of people in a household, whether it was in planting fields or feeding family members or in tending to the sick and elderly. Though they were considered low on the social ladder, their presence was important because the well-being of a house depended on them. If they were especially good or capable, they would have been appreciated all the more, but the first thing expected of them was to be faithful. That the disciples be like the youngest, like those who serve, means then that they remain at their posts and not shirk the responsibilities they have been given in God’s family. They must not listen to their fears and try to take everything into their own hands. Jesus is in their midst and even if for a little while he passes out of their sight, he will not abandon them. It is the time for them to trust in God. “I am among you as one who serves,” he says. In the Gospel, Jesus does not tell us so much what to do or how to do it as he invites us to enter into the deep movement of his own life. It is a way of disarming simplicity, the way on which God’s self-giving love comes to meet and to fill us. In what way can fears and insecurities lead us in the wrong direction? What brings us back to trust in God? How does the disarming simplicity of Jesus speak to me? What responsibilities have I been given in God’s family? Seek the Lord while the Lord may be found; call on God while God is near. Let the wicked forsake their ways and the unrighteous their thoughts. Let them turn back to the Lord, who will have mercy on them, to our God, who will freely pardon. For my thoughts are not your thoughts, neither are your ways my ways, declares the Lord. As the heavens are higher than the earth, so are my ways higher than your ways and my thoughts than your thoughts. Many people imagine the God we meet in the pages of the Hebrew Scriptures, our Old Testament, as an angry judge, unforgiving, ready to condemn people for the smallest infraction of his commands. They like to distinguish between this God and the God revealed by Jesus, a merciful Father who takes care of us and always shows his love and concern. Anyone who takes the time to study and meditate on the Bible will discover that this opposition is false. The God who showed himself to the people of Israel is the very same God that Jesus bears witness to by his words and acts. At the center of God’s dealings with this people is the story of the Exodus. It is a story that tells how God entered into the life of a group of slaves, far from their home, liberated them from their oppression and brought them to a beautiful land where they could be free. This story reveals a God who listens to the cry of the poor, who wants people to live to the full, to be happy, a God who can always do something new to break the bonds that keep us captive. In short, it tells of a God of tenderness and mercy. In the text we are reflecting on today, a prophet explains that this in fact is what makes God different from human beings. Human beings often respond to being rejected by others by rejecting in their turn. We find it extremely difficult to forgive those who have hurt us deeply. But according to the prophet, God’s ways and thoughts are not like ours. If a person recognizes his or her mistakes and turns back to God, God will always welcome that person. Our relationship with God can always begin anew. This is what we call forgiveness. God can act in this way because his behavior is not determined, or even conditioned, by the actions of his partner. As the Source of life, God can always find within himself the energy of love in order to respond to evil with good. The Christian teachers of the first centuries understood this, but they expressed it by a difficult term, one easy to misunderstand. They said that God is impassible. Where do we meet this God of unchanging mercy? Jesus tells us, “Come to me, all you who are weary and are carrying heavy burdens, and I will give you rest” (Matthew 11:28). Jesus reveals to us in all fullness the God who never tires of doing good, who always makes possible a new beginning for those who come to him. What changes in my life when I realize that God will always welcome me with love and joy? What would it mean concretely for me to “seek” or to “call on” God; where and how do I find him? Jesus said: Love your enemies, do good to those who hate you, bless those who curse you, pray for those who mistreat you. If someone slaps you on one cheek, turn to them the other also. If someone takes your coat, do not withhold your shirt from them. Give to everyone who asks you, and if anyone takes what belongs to you, do not demand it back. Do to others as you would have them do to you. If you love those who love you, what credit is that to you? Even sinners love those who love them. And if you do good to those who are good to you, what credit is that to you? Even sinners do that. And if you lend to those from whom you expect repayment, what credit is that to you? Even sinners lend to sinners, expecting to be repaid in full. But love your enemies, do good to them, and lend to them without expecting to get anything back. Then your reward will be great, and you will be children of the Most High, because he is kind to the ungrateful and wicked. Be merciful, just as your Father is merciful. In this passage, Jesus describes two ways of acting. One is what he calls the way of sinners, which simply means those people who do not attempt to do what God asks of them. Today, we could call this the “ordinary” human way of behaving. It consists in being kind to those who are kind to us, of giving to those who give to us in return. The eternal human tendency is to divide people into two groups—those who are with me, and the others, who are indifferent or hostile. Of course, there is nothing wrong with feeling closer to some people than to others. For different reasons, we all have more in common with certain people or groups. But when this leads to ignoring, criticizing, rejecting or even harming those who are not like me, it becomes a source of divisions and even wars. Then, Jesus speaks of the other way of acting. That is God’s way, and it consists in “being kind to the ungrateful and the wicked.” As we saw yesterday, God’s way is different from our human way because God is not changed by how the other responds. God is “impassible.” In other words, all God can do is love. Now, what is new about the message of Jesus is not that God is merciful. The author of Isaiah 55 already knew this, and it is found throughout the Hebrew Scriptures, centuries before Christ. What is new is not that God is merciful, but that we human beings can be merciful in the image of God! Jesus tells us to be women and men who are truly in the image of God, able to love their enemies, to do good even to those who mistreat us, to give without expecting anything in return. How is this possible? Is it really true that human beings can be like God? Where do they get the motivation and the energy for this? It certainly does not come from the strength of our character or from our will-power. God can give without receiving because God is the Source of life. But we are not the Source. For us to keep giving, first we have to receive. And this is what is new about the Gospel. In coming to earth as a human being, the Son of God brought God’s Holy Spirit, the energy in person of his love, right into the midst of the human condition. By the power of the Spirit Jesus was able to heal the sick and forgive sinners. He was able to go to the point of giving his life for us on the cross, granting his forgiveness even to those who tortured and killed him. And after his resurrection, he communicated this same Spirit to his disciples. As followers of Jesus, we become part of the community of believers animated by the Spirit of God. What struck those who encountered the first Christians was to see a community of women and men from very different backgrounds living together as brothers and sisters, sharing materially and spiritually, forgiving one another. Instead of dividing people into two groups, those inside and those outside, they welcomed everyone. They went towards others. They tried to live a universal solidarity. It was evident that the way they lived was different from the “ordinary” human way. And this attracted many people to them. The same Spirit that animated Jesus and the early Christians is still offered to us. Yes, it is possible for us to live a life which is in the image of God. We can be merciful, as our Father is merciful. But we can only do this together, supporting one another, and we can only do it if we open our hearts to God in prayer so that little by little he can transform our way of thinking and acting. And then the impossible becomes possible. Is Jesus describing a “utopia,” or have I seen examples of women and men who live in the image of God by loving unconditionally? When? Where? How? What steps can we take for our communities and Churches to become places of universal solidarity, where the divisions of society find healing?